Today's post about about something that is not really Singaporean, but has its roots in Malaysia. But since we are good neighbours, we like to share our cuisine too, right? Do you know they have their own version of Hokkien Mee/Noodles which is very different from ours? I didn't know at first, but now I do, and you do too! I found that out because of my 2 super foodie friends - Linda and Tim, whom are my ex-colleagues. We have been meeting up regularly to eat and they are Yoda-level at food, so padawan me has loads to learn. And Kong Kee KL Hokkien Noodles at Geylang was mentioned by Linda because it sounds very interesting - it is black, instead of the usual white. 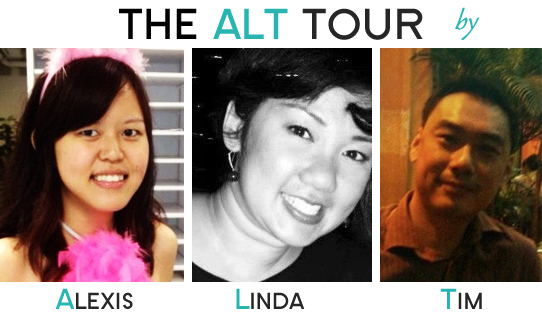 With that I'll also like to introduce a new series on my blog - The ALT Food Tour as explored by Alexis, Linda and Tim. We are ALT, we are alternative and we are gonna eat all the good food in Singapore! The origin of the food tour was ideated because Linda will be migrating to Perth by the end of May, and she will miss all the Singaporean food, which is why we need to do 1 last round. Also because I need to learn all the good spots in SG for food before she leaves me and Tim, and share it with my readers. With that, the idea was born. We already did up a list - and it is quite ambitious at that, but know this, and know it well: the food places that we visit will be worth a read because its not easy to get 2 superfoodies like them, and a noob with a food blog like me to go to somewhere. We already did one at Swee Choon Dim Sum, and this is next on our list. So.. let us be reminded what is our Singaporean version of Hokkien Mee. It is a mixture of white and yellow noodles, cooked with bits of lard and prawns and a broth. Usually accompanied by a great sambal chili. The KL version, however seems like the antithesis of SG's version. It is black, made with thick noodles coated in black sweet sauce and with lettuce and huge chunks of lard. The noodles are very smooth though and the sauce not too overpowering. However it had so much huge chunks of lard, and it was coated in so much oil, this dish is the most unhealthy thing I've eaten in months. (The photo was taken with an iPhone 3GS, pardon the quality, as I forgot to bring my phone out that day.) This dish is best shared between 3-4 people. We then ordered some side dishes as well to share because Linda heard that the salted egg cuttlefish was good. It was! The coating on the cuttlefish was really thick. Tim felt that it tasted a bit weird though, the combination. I thought it was quite a novelty but not exactly 100% satisfying. I still prefer calamari to be fried in batter. Another side dish that looked really interesting on the menu but turned out really bland was the pumpkin tofu. It was just plain tofu with a gravy that barely tasted of pumpkin. Worst dish of the lot, skip! The best among the 3 side dishes was in fact the Dong Po meat, which is braised pork with gravy. The gravy was actually slightly tangy, and the meat was soft and succulent. It was a delight. Lastly, the most expensive item on the menu is their Sang Har Mee. It is crispy fried noodles with giant prawns. It was also very good, less unhealthy. However I feel like I could get a better deal of a well-made crispy noodles at a zichar stall. Overall this pit stop to the tour provided us with a interesting experience have some cuisine that is not from our shores. I was also quite surprised to see that it was in an airconditioned restaurant instead of a coffeeshop. Plastered all over their shop were their other famous dishes like the chili crab and there was a gigantic fish tank beside the restaurant. They must be doing quite well, with the taxi ads and all. The whole meal costed around $30 per person if I am not wrong, which is pretty steep. We went there the second time this Wednesday. We had Lobster bee hoen, toufu, and white pepper crabs. The bee hoen was good, toufu was ok but the crab was the smaller Indonesian type and was billed as 1.1 kg ( 53 dollars) when it was more like 600gram at most! Such dishonesty does not deserve our visit EVER again regardless how tasty the food! To all would be patrons of this restaurant, do demand to inspect the weight of the sea foods for the actual weight. Make sure you are served the weight you pay.